Welcome to the continuing story of my torrid love affair with the made-for-TV movie Sooner or Later. It’s funny. I post about a lot of things on this blog. Some of them are about the process of writing and publishing while others are controversial appeals for civil rights. However, no matter what posts have their ups and downs in popularity, the tongue-in-cheek one I did on how Sooner Or Later Ruined My Life constantly scores attention. Last night I re-watched Sooner or Later to gain a more realistic, adult perspective of its impact on my life. Satire again hit, because if I took my findings too seriously, I would need therapy. Think I’m kidding? Warning: You might want to look up the number for a good shrink before proceeding. Revelation 1: My writing career began the night this film aired. Revelation 2: I thought the only thing this film got me addicted to was rocker boys. Wrong! Revelation 3 is a by-product of Revelation 2: This is why I think I can afford expensive face goo. If a thirteen-year-old without a job can, surely I can as well. Revelation 4: Caroline is brilliant! I once thought Jessie’s friend was pretty ridiculous; however, I have come to appreciate her genius. The scene where she talks about kissing her dentist with her arm seems so juvenile, but just imagine having that opportunity now with a hot actor or musician that you have had a crush on for years. Caroline is definitely not the silly friend she appears to be. She has the dual role of being the goofy little sister and the adult voice of reason. I totally get that statement now! Caroline is so worldly!!! Revelation 5: Sooner Or Later was the original version of The Rules. Revelation 8: Jessie is a musical genius! After two lessons, not only does Michael parade Jessie to his friends like she is the queen, she is also good enough to sit in with the band. No wonder why I always expect to pickup my guitar and magically sound perfect. I had to stop there, because my mind was spiraling out of control. Jessie was becoming a false deity, and a padded cell was calling me. However, before I could hit the stop button on the DVD player, Jessie’s dad became the jailer that slammed my cell door shut. To paraphrase him, “Thirteen-year-old girls are older now. They are forty-five.” Yeah, if you put me in Jesse’s place, that is kind of true. However, with me it is sort of a circular argument, because while I am closer to forty-five than thirteen as far as age goes, I obviously still identify with Jessie a little too well. Wait, does this mean I am thirteen again? I need to get back to that makeup counter! So, in my revisit of this gem of a film I found that while I cannot wait until my daughter is old enough to watch it with me, I also fear that moment. Should I let her enjoy Sooner Or Later for all it is worth, or should I ruin Sooner Or Later by exposing it as a cautionary tale? I’m sure I’ll let her love it so she can make the same mistakes I did. After all, she is her mother’s daughter and will do that anyway; thus, she will need something to blame. I’ll chime in on that sobbing, cake-devouring scene though. Her waistline will thank me later. 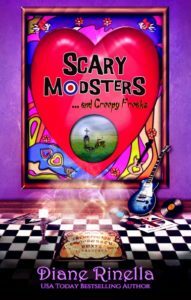 Diane’s love of 60s and 70s pop culture shines through in the Romantic Comedy Scary Modsters … and Creepy Freaks, winner of the 2017 International Body, Mind, Spirit Award for Excellence in Visionary Fiction. 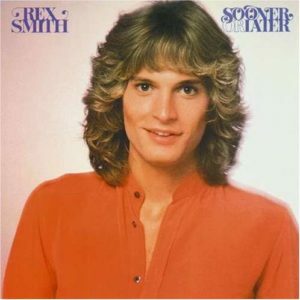 Tagged movie, movies from novels, rex smith, sooner or later, teen films, YA novels.